Below you’ll find the canonical reference for Saint Patrick’s Day email planning. From email examples to specific promotional strategies, we’ve included everything you need to ace your campaign. 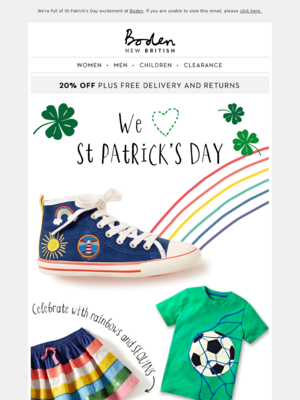 A stand-out inbox presence, great animation and a curated product selection give this St. Patrick's Day-themed email more oomph for the money. Notice how the subject line creates a little intrigue, and the preheader ties it into St. Patrick's Day. 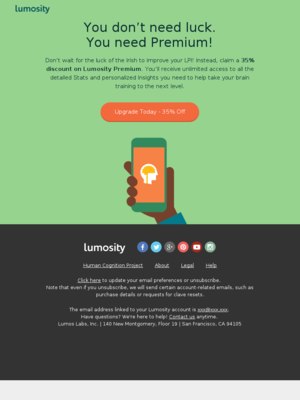 We also loved the bright colors and the subtle animation in the email body. At first, this email looks like a cluttered mess. Then, it all makes sense: The evolving color scheme of the featured products makes a kind of rainbow. It's a compelling way to get readers to keep scrolling and watch the colors change. And then, at the bottom (the end of the rainbow), there's a pot of gold with the offer. Lovely execution! We liked this email the minute we saw the subject line: “We're Dublin this 17.5% Discount — Lucky You.” Your subscribers will see lots of bad puns and clichés in their inboxes in the weeks leading up to St. Patrick's Day. Having “Dublin” double for “doublin’” is a fun way to highlight the offer in the subject line. Inside the email, we like the clever animation. Plus, the designers didn't get so caught up in their cleverness that they forgot something essential: the fiery orange call to action. If you’re going all in on St. Patrick's Day, this email will help you get out in front of the competition. 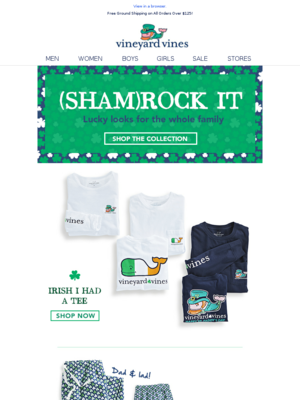 It’s drenched in holiday spirit from top to bottom, with amusing puns and a clever St. Paddy’s take on Vineyard Vines’ whale mascot. This all-Irish approach makes sense because people who order holiday attire need time to ensure it arrives in time, and your follow-up email can be more straightforward. St. Patrick’s Day has a short shelf life. So a countdown timer helps you maximize your email exposure and persuade customers to act fast. This email, sent on St. Paddy’s morning, goes all in on urgency, from "Starts Today" in the copy to the "Shop Sale Now" call to action. This approach would be overkill if you sent it a week ahead, but it works on the day itself. We got a big charge out of this clever Shinesty email but also give it props for getting down to business first (the offers are at the top of the email) before veering off into its shocking-but-true facts about St. Paddy's Day. Click the email to see it in all its goofy glory, and keep scrolling on down to the surprise ending. 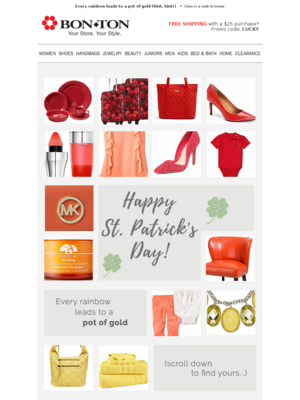 Start planning your St. Patrick’s Day email strategy with great examples. This Hurleys UK email calendar is based on Hurleys UK, who sent 2 emails for St. Patrick’s Day in 2018. This Alex and Ani email calendar is based on Alex and Ani, who sent 0 emails for St. Patrick’s Day in 2018. This HOMAGE email calendar is based on HOMAGE, who sent 0 emails for St. Patrick’s Day in 2018. Will you simply send one email on St. Patrick’s Day or will you send a few emails leading up to it, including a “last chance” email once the event is over? Based on 911 emails mentioning "patrick’s", "paddy's", "patty's", "four leaf", "patrick", "paddy" in the subject line. 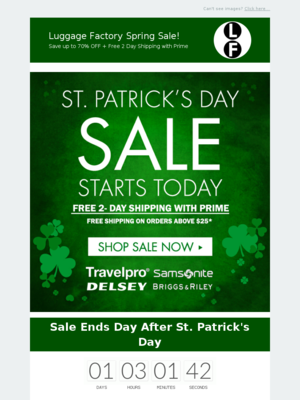 Discover the most popular types of promotions used for St. Patrick’s Day. Understand how steep a discount companies offer for St. Patrick’s Day. You can toggle between Dollars Off and Percent Off. Ace your St. Patrick’s Day email content with these ready-to-implement strategies. Enjoy! On March 17th, it’ll take more than the luck of the Irish to spin emails into gold. Green beer and shamrock-shaped sunglasses might not be traditionally Irish, but they helped push St. Patrick’s Day spending to a record $5.9 billion in the U.S., according to 2018 National Retail Federation projections — the highest level in the survey’s 14-year history. An estimated 149 million Americans planned to participate, the NRF said. Most are younger (77% percent are ages 18-24), but the biggest spenders are ages 35-44 ($45.76 per person on average, compared to $39.65 across all ages). Did you know? It’s St. Paddy’s, not St. Patty’s. Here are a few strategies to make sure you can ace your campaigns for St. Patrick’s. 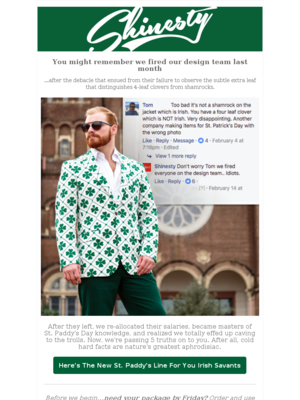 It’s easy to rely on classic phrases and stereotypes when writing copy and subject lines, and St. Patrick’s has plenty. But remember that every other copywriter is using the same phrases. Using emojis is another tactic that can get you noticed. We’ve seen a lot of shamrocks ☘ in subject lines, which are attention-getting in both size and color. Other popular emojis include rainbows 🌈, leprechaun hats top-hats 🎩, the green heart 💚 and beers 🍺. The NRF’s St. Patrick’s Day spending tracker showed projected spending dropped in 2015 and 2016 before spiking to record estimates in 2017 ($5.27 billion) and 2018 ($5.92 billion). St. Patrick’s Day 2017 fell on a Friday and, in 2018, on Saturday. Which means that in earlier years the big day obviously landed in the middle of the week. But, even in years when St. Paddy’s Day falls on a party-unfriendly Tuesday or Wednesday, you can aim for a bump in sales by starting promotions on the previous weekend to catch early partiers or extend your celebration through the week and into the weekend. St. Patrick’s Day isn’t just shamrocks and soda bread. Given its appeal to the 21-to-35 demographic, the day has an underlying edge, too. If that’s your customer demographic, going edgy can help you grab attention, entertain subscribers, consolidate your brand image and drive a purchase. Of course, edgy is risky, too. Don’t spend so much time entertaining your audience that you distract them from clicking to your website to buy something or otherwise convert. You could end up alienating your audience and damaging your brand. Use everything you know about your customers and how much brand equity you have with them before wandering too close to the line. Want to see more email examples? Check out our curated St. Patrick’s Day list!